John’s design translated into a terrific looking model that was fun to light and photograph. It was initially a physical model, not CGI. The one issue we had with it was its weight. The model was photographed at the motion control facility, Image G.
Because the models were shot with motion control, we were able to use a very effective orange matte process. The model appears to be floating because it is on a post covered with orange material. 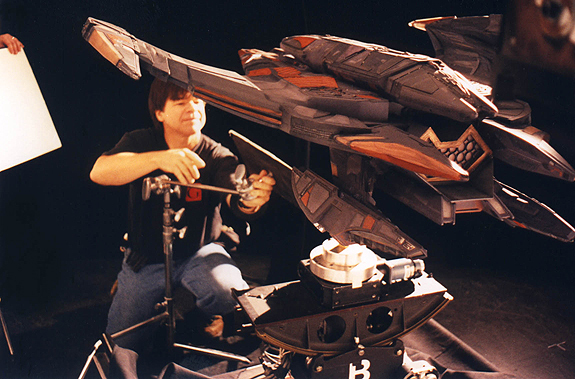 Dennis Hoerter monitoring the Jem-Hadar model and motion control rig. The Jem ‘Hadar model was used in a number of the DS-9 episodes that comprised the ‘Dominion war’ story arc. This article and images are used for non-profit educational purposes only. Hokey-smokes, that’s the first I have EVER seen/heard of orange-screen, eh! Why was this used David, over blue or green-screen? Thanks David, for the great post! The orange screen process was used because it was so easy and effective. It actually used black light to make fluorescent material glow. That meant the model did not get color “spill” or contamination as with blue or green screen. It took a slow exposure so motion control technology made it viable for Trek. When the footage was tele-cined to digital the orange color was easy to convert to a holdout matte (in CG talk: alpha matte). I miss the physical models, too. I liked that I could light them and actually see an result in real time, not after a render. I still see green-screen being used today, why do you feel we don’t see more orange-screen? Is is something that just benefited the reducing spill with close-in work with models under motion-control, as opposed to say, green-screen backdrops set up for later comp-ing in digital set-extensions and the like? With computer speeds and preview renders nowadays, i.e. modo’s native previewer, and Worley’s FPrime for LightWave (as LW native previewer, VIPER, is junk, IMO), lighting these days is pretty much real-time. Plus, if you do have to pull a render, turn off all AA (anti-aliasing), and it takes only a few seconds. Like I said though, the key is a fast computer, eh. I figured you knew the lingo but I am trying to make this a bit of a teaching blog because I urge my students to read these posts. The Holdout = alpha translation was for the general reader. 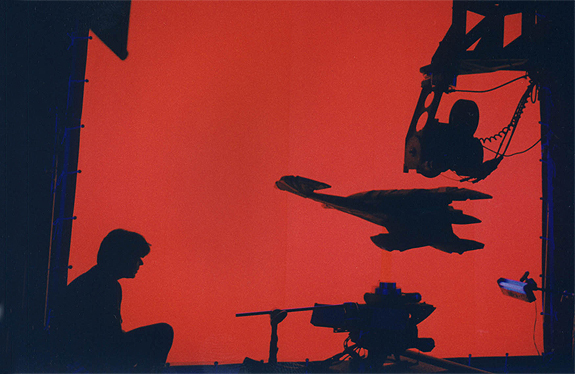 Green and blue screen work for the live action effects. The orange screen is really low light levels so motion control is needed. BTW, 1-day early Happy Father Day too! Hey David – huge fan of the work you all did on DS9! Thanks for those photos. 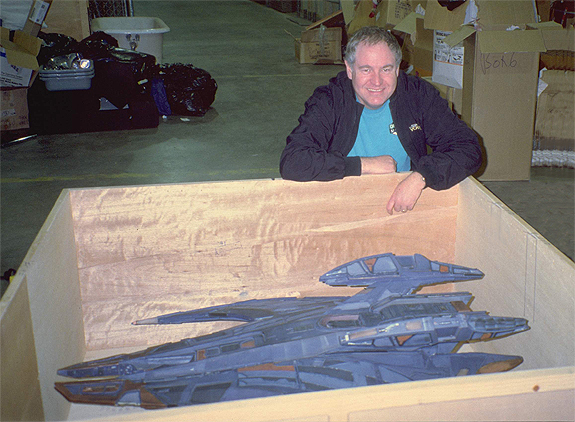 It’s cool to see how huge that Jem Hadar model actually was. I also imagine that an orange backdrop might be more difficult to distinguish from human skin tones than a blue or green screen? I don’t know of anyone trying it with people. The black light was really bad for the eyes! This technique really is for inanimate objects and long exposures. Fabulous looking miniature.Where are most of these models boxed up and stored now ? I think many were auctioned off by Paramount. So if I understand you correctly David the orange sections of the physical model are coated in a UV reactive paint? I can’t see anything glowing on the last photo you posted?? Does anyone have a screen grab that used the physical model so that we can compare it to the CG version? I will try to find a screen grab. I pulled CG image because it was confusing and I wanted to focus on physical model. The model did not have any fluorescent paint; only mounts and BG screens used to generate mattes. Ah…so how was the engine glow achieved or did it not have any? The models had internal lights for engines and nacelles, etc. Another advantage with motion control was that we could do separate light and engine passes for exposure and filtering control. Yeah the models were almost all auctioned off at Christie’s a few years back. It is sad, as it’s the end of an era. But on the other hand, IMO, it’s nice that the stuff got into the hands of folks that really love it and will care for it properly. Better than sitting un-used, unseen, and unappreciated in warehouse crates forever, or worse yet, demolished like all the über-beautiful ENTERPRISE set pieces. Looks like this model went for $7200 bucks, BTW. At $7200 he must have been paying by the pound. LOL, that’s nothing though David, the E-D went for over a half million bucks! So would I be right in thinking that the largest ship miniature you had to shoot on Star Trek was the DS9 station? As I remember, DS-9 was about 6 feet across. Voyager was close at about 5 feet long. First off accept my gratitude for starting blogging. Finally thanks to wonderful people like yourself, Doug Drexler, John Eaves and others we are getting the behind-the-scene info, particulary on those unsung heroes, the ships, many of us have been pining for for decades.